Enduring harsh winters is the Canadian way. No winter phenomenon is unheard of in the ‘Great White North’. Blizzards, black ice, frostbite and wind chill: they’re all part of the Canadian winter experience. ‘Cold out, eh?’ A winter appreciation from Montreal. The sky over Montreal is crystal clear and bright blue, seen from Mont-Royal, the mountain near the centre that gave the city its name. 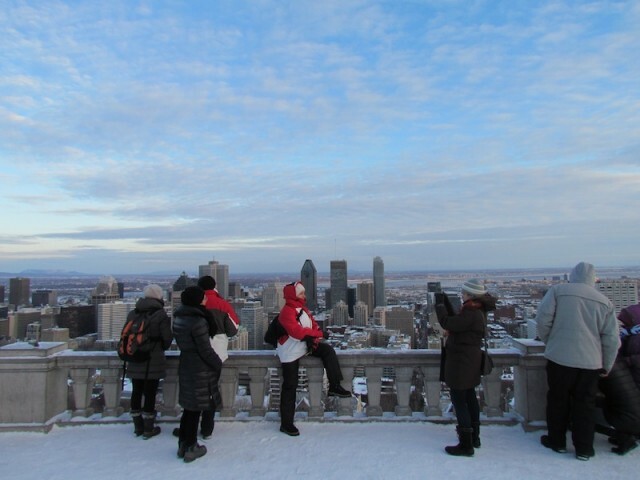 Montrealers dressed in parkas – thick, hooded winter jackets – brave icy winds to take in views of the winter landscape: the office towers of downtown emitting steam for heating, the chilly St.-Lawrence River, the vast white plains and the snow covered hills on the horizon. It is grand, icy and bleak. Welcome to winter in Canada, nicknamed ‘the Great White North’. Hikers take in views of Montreal at the lookout on Mont-Royal, the mountain near the city centre. Despite the cold, it is crowded on the mountain. People are taking advantage of the bright December day to engage in winter sports. Many are cross-country skiing on the considerable snow pack. The footsteps of hikers crunch on the compressed, slippery white surface. Some people venture off the main paths wearing modern snow shoes – steel contraptions that prevent you from sinking knee-deep, or thigh-deep, into untrodden snow. On nearby Lac aux Castors, people are skating. Children are sliding down a slope on sleds, screaming for joy. Harsh winters are a staple of Canadian cities like Montreal, and winter fun is one way to make the best of it. Because whether you like it or not, one thing is certain: every year from early December to late March, the city, so warm and lively in summer, goes into a relentless deep freeze. Unless you flee to the south, there is no escaping it: you will be hit by Arctic winds with enough force to take your breath away, make your eyes tear and freeze up your nostrils. 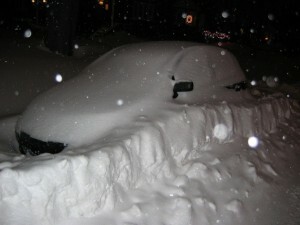 You will get two feet of snow dumped onto your stoop in a matter of hours, burying your car. And just when you’ve shoveled your way out, another couple of feet will fall. Guaranteed. Try digging out of that. No winter phenomenon is exceptional here. No one blinks at severe winter cold of minus 10 to minus 15 degrees Celsius. With the so-called wind chill factor, it is not uncommon to feel like minus 20 to minus 25 C. Most Canadians are fully prepared for heavy snowfall; winter storms that dump two to three feet of snow are normal in almost all parts of the country. Ice storms, whiteouts, Arctic winds – it’s all par for the course. And Canadians like to complain about that. “Cold out, eh?” is an often-heard platitude across the nation, from Newfoundland in the east to British Columbia on the West Coast. The hardships suffered when shoveling the front yard, the frustration over a car that keeps burning rubber on a patch of black ice: everyone can talk about it. But pay close attention, and you’ll notice something playful in those gripes. Because secretly, Canadians are quite proud of their ability to endure the blows winter delivers. Canada would not be Canada without that stubborn endurance. In a vast country with a highly diverse population that sometimes lacks cohesion, there is at least one thing that binds almost everyone together: winter, which bombards you with ice and snow and inhuman wind chill factors. It is the common opponent that creates a bond. As it happens, winter rarely disrupts Canadian life in a serious way. Canadians are prepared for it, arming against it with thick parkas, tuques and sturdy boots. And with heavy artillery used to keep the roads passable: industrial snow plows for streets and sidewalks, monstrous snow clearing machines that vacuum accumulated snow from the streets and blow it into trucks that whisk it away to giant snow dumps, spreaders that hurl fat salt pellets – it’s harsh, rough and dirty, but it works. In Montreal, the snow clearing army usually comes into action before a storm has subsided. And even after a full day of fat flakes from the sky, the evening rush traffic keeps pushing through the city – more slowly, but surely. Train and bus services continue, and conditions have to get pretty extreme before a school or office is closed or an event is cancelled. That is winter in Montreal. It’s kind of crazy when you think about it: what reasonable human being will endure that cold shower every year, knowing full well there are alternatives, like Florida? The answer is in the view from Mont-Royal: winter is in the genes of this country, in the same way that the eternal battle against water is essential to the Netherlands. This country is winter, as the singer Gilles Vigneault aptly put it in the 1960s, referring strictly to Quebec in an unofficial anthem of the French-speaking province: Mon pays, ce n’est pas un pays, c’est l’hiver.